David Walters is an International Christian Revivalist & Author. He speaks at Church Family Camps, College Campuses, Crusades, Christian Schools, Children's homes, Juvenile Detention Centers, Churches & National Children's Pastors Conferences. ​He ministers to Children, Youth, Students, Parents, Teachers, Youth & Children’s Pastors. One thing I have learned and I'm still learning, I cannot do anything of lasting value without the presence of the Holy Spirit. He is very precious to me. I cannot bring Revival, I've tried many times in vain. But He can and when He does, I stand in awe! How simple it can be, when we stop taking control and allow the Holy Spirit to take over and run our meetings, our church services and our lives. God can do a little with a lot, a lot with a little and everything with nothing. ​David Walters was born in England. After sitting under the ministry of Dr. Martyn Lloyd-Jones for ten years, he received the Baptism of the Holy Spirit and soon became one of the pioneers in the "House Church" movement. Within a short time, the meetings at David's house in a London suburb grew to a size where they met in the local town hall. Eventually David became a traveling elder within the Fellowship and ministered in many Fellowships, Churches, Public Schools and Universities. David has ministered and is scheduled to minister in many countries around the world as well as throughout the United States. God placed a burden on David's heart for parents who are failing to raise their kids to fulfill their destiny in God. God uses David to impart a vision to pastors, elders, parents and teachers in a way that brings the younger saints into a place where they become effective, viable members of the body of Christ. Currently, many children and youth have a nominal understanding of being born again, but are not having an ongoing personal experience with the Holy Spirit and Jesus Christ, instead they are living off their mother and fathers religion. He desires to see the youngsters take their place with the adults in God's purposes and not just be entertained in youth meetings or baby-sat in children's church. David realizes that most church goers have never been discipled and the churches have failed to bring them into their full spiritual potential, so they live far below their God given destiny. If that is true, then their children have also suffered. David has a unique rapport with young people. He is often very humorous, as he uses children and teens to demonstrate his revelatory teachings, but he doesn't use props, movies, coloring books, power points, or games like some churches. Instead, David believes young people need anointed preaching coupled with signs and wonders. 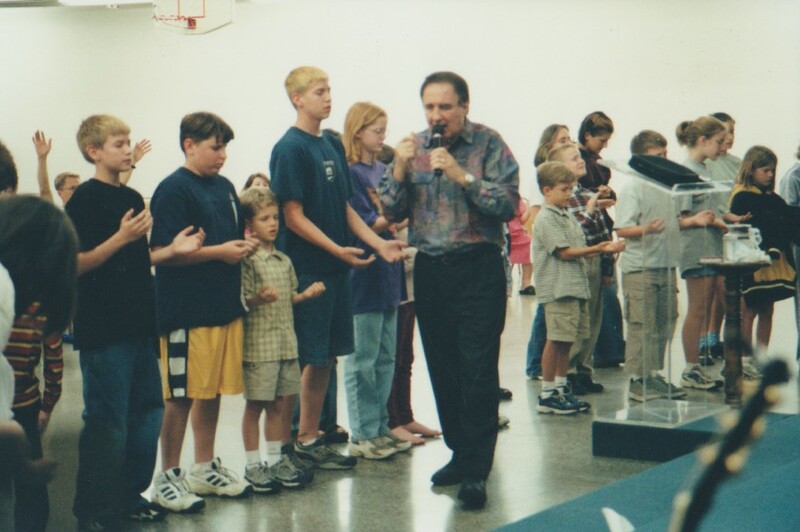 David Walters has witnessed the Holy Spirit move on whole churches with everyone, including children and teenagers, as well as adults, who were touched by God's power. In his special "Family Revelation Ministry" workshops, he does not only unfolds the keys to parents and teachers but also empowers them to become successful in raising families, including the youngsters to become godly, powerful and anointed. ​David has been featured in "Charisma" magazine and has written articles for "Ministries Today." He was also interviewed on TBN By Dr. Mark Chironna, on "Atlanta Live TV Program", and has appeared on "It's Super Natural" with Sid Roth several times. David has written and published twenty three books in all, ranging from spiritual books, to books on other subjects, such as children's adventure books. Many of David's spiritual books are written for youth and children's pastors, teachers, parents, children and teens, while his other spiritual books are written for adults, although certain children would also enjoy or benefit from them. 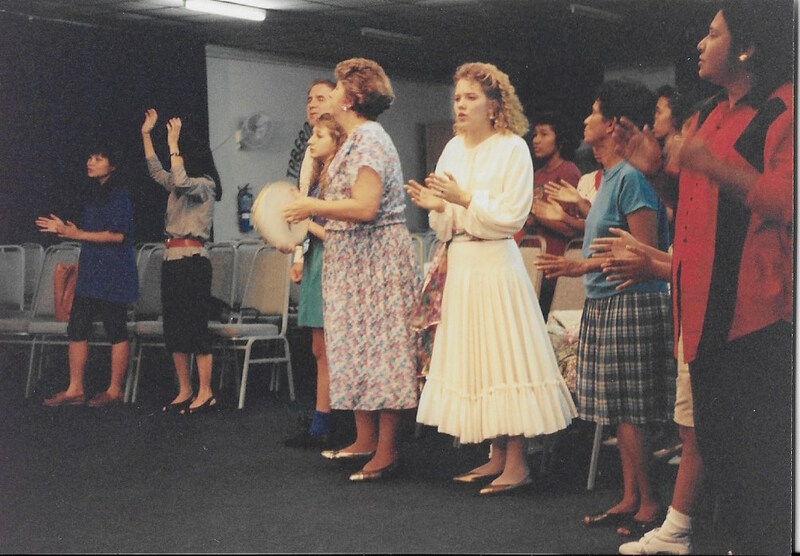 In 1994 A woman who was a children's pastor of a small church attended a Charismalife Children's Teachers Conference where David was one of the speakers. Her name was Becky Fischer. Years later she told David that his teaching changed her life. 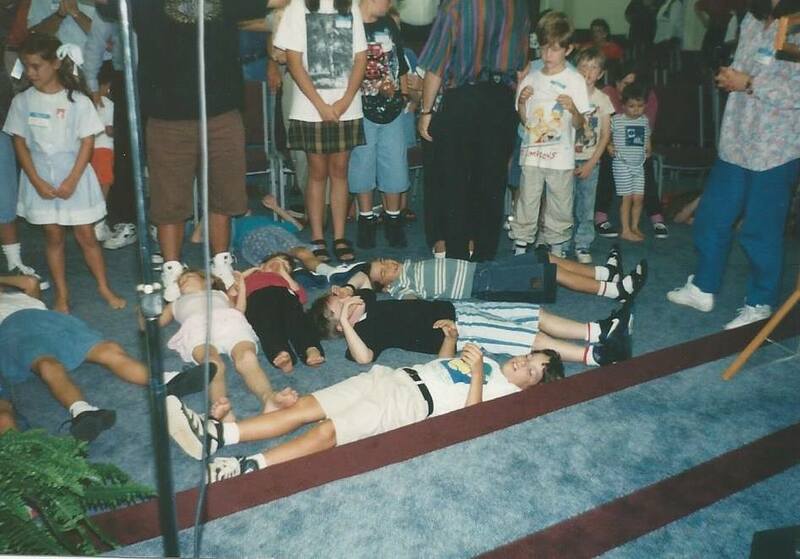 She now has a world wide very successful ministry called, "Kids in Ministry International." She says that David was the grandfather of the vision that they now have. ​David moved to America with his wife Kathie and their daughter Faith, and later had another daughter Lisa-Joy. Currently David ministers both Nationally and Internationally to families, pastors, youth pastors, children's pastors, parents, children and teens and he is one of the leading ministers in the USA, and has taught at hundreds of different kinds of churches comprising of Denominational and non-Denominational throughout the USA. David has also spoken at many National Children's Pastor's Conferences and the World Congress on the Holy Spirit in Orlando. He has also ministered in the same conferences with other well known ministers such as T.L. Osborn, Benny Hinn, T.G. Jakes, Charles Capps, Bob Weiner, Bishop Bill Hamon, John Arnott, John Kilpatrick, John Dawson and many others. He has also ministered to WYAM leaders. GO WITH DAVID IN SPIRIT WAY AROUND THE GLOBE TO THE COUNTRIES WHERE HE HAS MINISTERED. France, Italy, Germany, Hungary, England, Scotland, Hebrides, Wales, Ireland, Russia, Holland, Lithuania, Estonia, Latvia, Malta, Gibraltar. Bermuda, Bahamas, Barbados, Jamaica, Trinidad, Aruba, Puerto Rico, Suriname, Mexico, Guatemala, Singapore, Korea, Malaysia, Japan, Kenya, Ghana, South Africa, Egypt, Israel, Canada, Australia, New Zealand, Tasmania. but he's still open ). India has been asking David to come for years, but he is still waiting for the green light. ​David's daughters, Faith and Lisa Joy, traveled with him when they were children, and later David's two grandsons and granddaughter. David believes that it is time for whole families to become part of God's mighty kingdom. 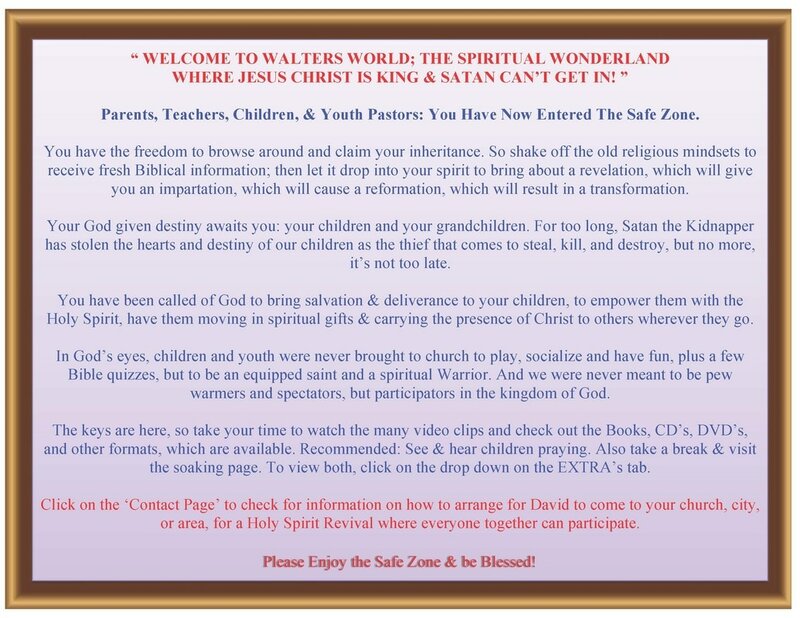 He says, "Children today are being born into the 'War Zone', therefore we must all be dressed for spiritual battle at a very young age. He stirs up the saints to live in the grace of God and obtain their inheritance joyfully. Many awesome manifestations take place in his meetings and deliverance, healings and joyful enthusiasm with humor, pull people from all ages.